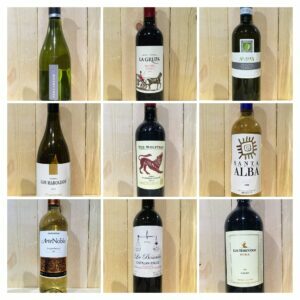 Here at The Wine Cellar we offer the largest selection of wines and spirits on the Island. 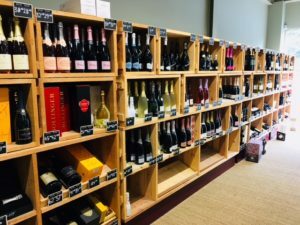 The Wine Cellar was established over 27 years ago and has recently relocated to The Milestone, Peel Road Douglas. We are all passionate about wine and we have, between us, over 150 years experience in the wine trade. 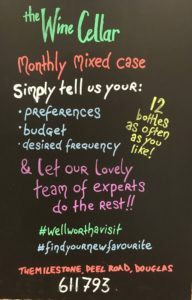 Some great new wines and offers have just arrived in store too – see our special offers page for more details, but better still, call in and see for yourself. Our Spring and Summer tastings dates have been confirmed. Please see our events section for more information. In the meantime, our draft tasting sheet for Friday 26th April is available here. We always have some great special offers on, so keep your eye on Facebook and our special offers page, or better still come in and see us. Why don't you sign up for one of our great events which are on throughout the year. Be sure to join our mailing list to hear of these first, but updates will always be available on our website.